UFO Daily Bread: "IN THE NIGHT SKY"
On February 26, 2013 I had the privilege of attending the "EBE FILM FESTIVAL SCREENINGS". This highly entertaining event kicked off the "22nd ANNUAL UFO CONGRESS CONVENTION & FILM FESTIVAL 2013" held in the FORT MCDOWELL CASINO/RESORT in Fountain Hills, AZ. An opinion many people in the UFOLOGY field probably agree with. I was thrilled to find Producer FELIX OLIVIERI and Researcher LINDA ZIMMERMANN selling copies of their film the next day. They were so excited to learn how much I'd enjoyed their film, that before I realized what was happening my gushing review was filmed! I wasn't the only one who liked their movie. 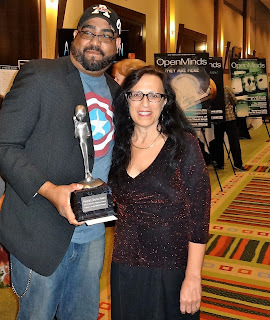 Felix and Linda had the honor of getting onstage Saturday night, March 2nd, to accept the award "2013 International UFO Congress EBE Film Festival People's Choice Award". 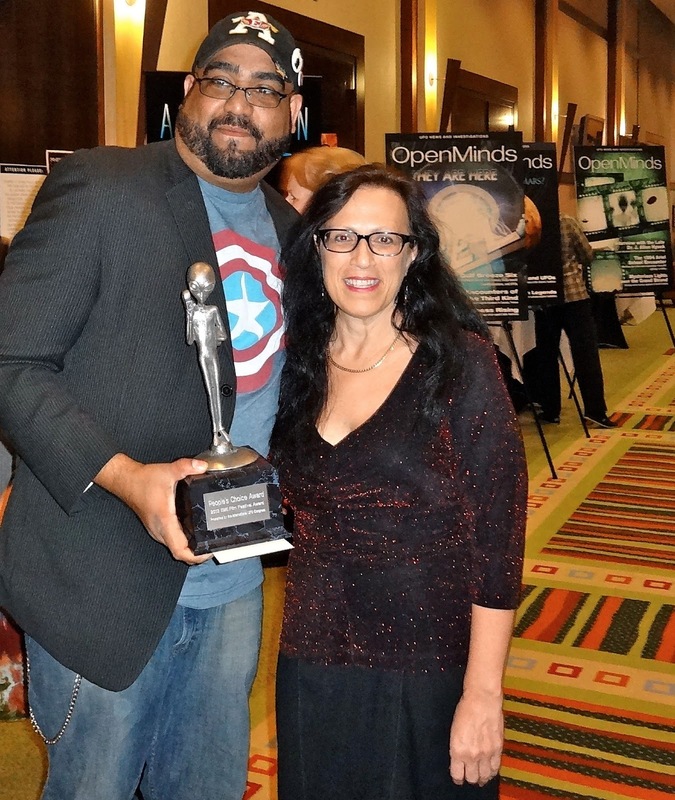 FELIX OLIVIERI and LINDA ZIMMERMAN with the "People's Choice Award"
"IN THE NIGHT SKY - HUDSON VALLEY UFO SIGHTINGS FROM THE 1930S TO THE PRESENT" . I hope this write-up pleases both Felix and Linda. It was a pleasure to have met them both in person. You can follow them on facebook by typing "In The Night Sky" in the search bar. Finally, I leave you with a photo of myself with Linda and Felix taken at the conference shortly after purchasing their film and book. 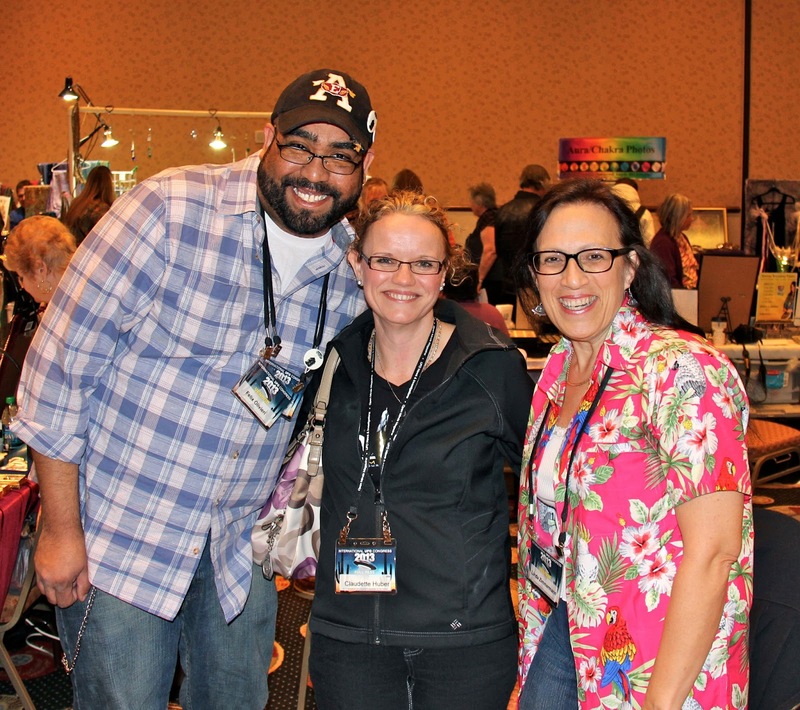 The Paranormal and The Sacred Show!